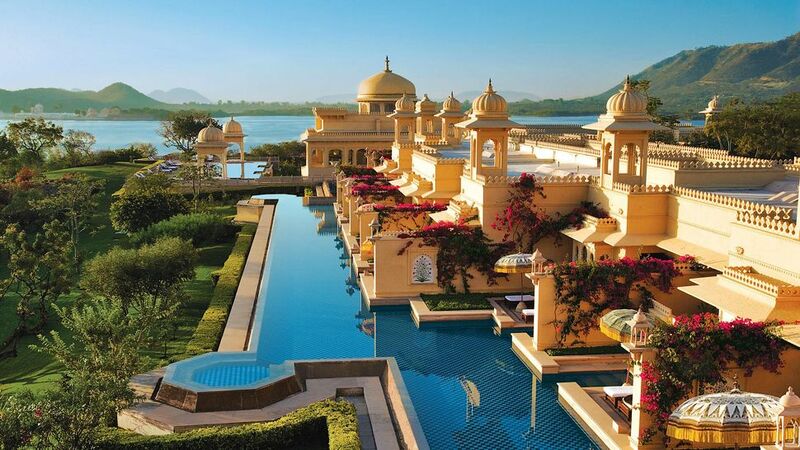 Udaipur is a city that deserves a special mention in the Rajasthan. Known as the “City of Dawn” and characterized by ivory-colored buildings, it is the ideal place to spend a few days and recover from the stress that often cause the traveler in other cities of Rajasthan place. We were pleasantly surprised Udaipur cleaning, compared to other Indian cities and also that we will not be attacked constantly and unceasingly by commission. 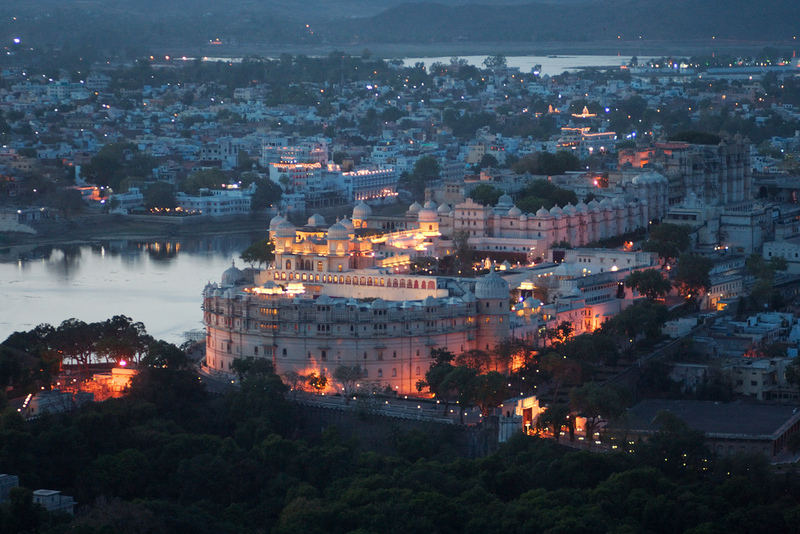 This coupled with the romance of the city and contagious floods our senses, make Udaipur a must stop. Chosen as a favorite destination of 2009 according to revistaTravel & Leisure, Udaipur surprised by its magical atmosphere between lakes, canals and palaces that seem taken from a story. Udaipur looks like a small kingdom, immersed in all its magnificence in a city dominated by the silhouette of huge towers, fortresses and palaces. At the foot of the Aravalli hills in a gorgeous valley south of Rajasthan, Udaipur is known as the City of Lakes, or the Venice of the East, by the way the city adapts to the rivers, canals and lakes . But besides the natural beauty, Udaipur sum varied architectural wonders of the extensive domain c era, a period where many palaces were built. Undoubtedly Pichola Lake and the palace built on an islet in the middle are the enduring image of the city. Currently the palace is a luxury hotel, so remains largely inaccessible to the mortal as simple as it was yesteryear. Other palaces of Udaipur, museums remain accessible to the public, including the magnificent City Palace Udaipur, a number of palatial buildings lakeside balconies with unsurpassed views. The city was founded as one would expect by the Maharaja Udai Singh II in the mid-sixteenth century. The old side next to the wall is a magnificent complex of palaces, temples and streets to get lost and enjoy. One of the inevitable activities in Udaipur are shopping. Special fame are the miniature paintings, classic example of Rajput-Mongolian art. They may also be worth textiles, gold and silver, and a farollillos quite popular fabric. If we want to visit the less tourist bazaars we approach the area of ​​the clock tower. Remember that being in India bargaining is required and necessary, since the tourist prices are generally double the less the local price. If we take a ride on horseback, the best option is Kumbha Palace, a hotel that offers these trips two hours for 500 INR. But if what we want is to hire a circuit walk around the city, our selection in this case is RTDC Hotel Kajri, costs 78 INR for groups of 5, lasts five hours and begins at 8:00 am. 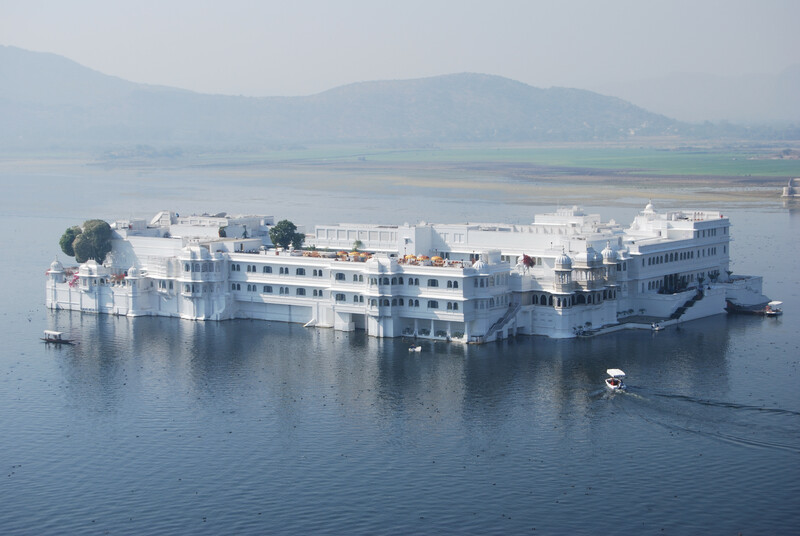 Pichola Lake: This imposing mass of water 4×3 km surface contains two islands within it. Despite its huge size, it is shallow, so that in times of severe drought dried part. If the depth allows, we can make a boat trip, leaving from the dock of the City Palace, located in its eastern part. It is also interesting to walk along its northern shore, watching the ghats and Dhobi, launderers water. 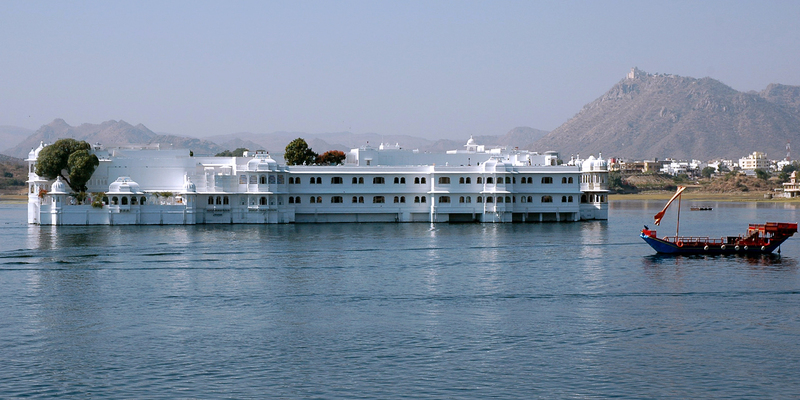 Jagniwas Island: It is the majestic and idyllic Lake Palace Hotel. Jagmandir Island: It houses the Palace Jagmandir Island. It was built from 1620 by Maharaja Karan Singh. Legend has it that Shah Jahan, Mughal emperor who built the Taj Mahal, was inspired by the palace. The island has a wonderful row sizable elephant carved in stone and offers visitors a great view of the Golden Palace and the rest of the city. City Palace: This is the largest of Rajasthan well worth the 25 INR to pay the entrance fee and wander through its buildings, patios, balconies, towers and cupolas. Its facade is 244 meters long and 30 meters high. It is located on the eastern shore of Lake Pichola. Jagdish Temple: Located 100 meters from the entrance to the City Palace. It is a sample of Indian-Aryan style. Shaliyon-Ki-Bari: Also known as the garden of courtesans, was built by the servants of a princess. By 5 INR, we can relax with your pond with lotus flowers, fountains and elephant carved in marble. By Air: Indian Airlines and Jet Airways offer flights to Jaipur, Mumbai and Delhi with a stopover in Jodhpur. Bus: The RSTC offers lines to Agra, Jaipur, Ajmer, Jodhpur, Chittor and Delhi. Other private companies offer also enter your destination Mount Abu, Ahmedabad and Mumbai. By train: Due to the difference in track gauge when not many destinations offered. Currently, Delhi, stopping at Chittor, Aljmer and Jaipur. Udaipur airport is 25 km from the city so you can take a taxi for about 200 INR.